It's been one heck of a busy week. I've managed to post something almost every day for #Inktober / #Inktober 2017. Up to now I've found the experience very rewarding. I've surprised myself, too. It's amazing how much one can get done in one day if one really focuses on the jobs that need doing. I've another busy day ahead today, so I'm keeping this post short. But have a great weekend everyone and happy PPF. Thank you, Valerie, for your kind comment. I've been working hard to improve. I think it's beginning to show. Thank you for visiting my blog! I agree you, when we decide to be effective we can do a lot. Hi, sirkkis. Thank you for commenting. Yes, it has surprised me how much I got done this week. Thank you, Elke, for your kind words. Very much appreciated. Hi, Susan. Thank you for your very kind comment. I thought I would give Inktober a try, just to see how I got on. I'm enjoying it immensely. Your beautiful design has such depth and detail. Thank you, Faye, for commenting. Very much appreciated. these pen designs are amazing John! Really, you could compile a fantastic coloring book of these pages and they would def. sell. Thanks for stopping by my blog- and what? I could not believe it when you said you cook everyday but Christmas-wow!!! I'm the only cook in my house and even i don't cook all those days in a year. hats off to you, and happy PPF! Hi, Linda. Thank you for taking the time to comment. I am thinking about a colouring book. I'd like to do some different designs for it though. I actually like cooking, but everyone needs a break sometime. Thank you, SLScheibe. I've enjoyed Inktober, but I think I'll need to slow down a bit. 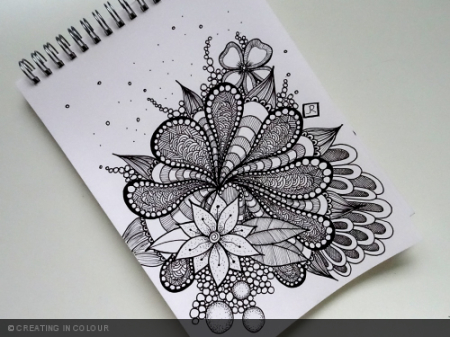 Your doodles for Inktober are so beautiful. Very delicate .... Good on you for keeping it up! Happy PPF! Thank you, denthe. I think my doodles are improving. Practice does indeed help. Stunning work...and yes, what we focus on gets done! I recommend to those complaining there is no time for art, to schedule time like a doctors appointment so you are sure to have creative time!! Hi, Giggles. Thank you for commenting. I agree; I think we can all schedule some time to do a little art. Congratulations on keeping up with Inktober. This is a beautiful piece! Hi, Irene. Thank you for commenting. Glad you like it. Thank you for visiting and commenting, Miss Marple. Very much appreciated. John your ink art is superb. It is like looking into a kaleidoscope, there is so much depth. Hi, Nicole. Thank you for your kind words. Glad you like it. Your artwork has such beautiful detail. It is quite lovely. Hi, Beth. Thank you for stopping and taking the time to comment. Very much appreciated. Thank you, June, for commenting. Very much appreciated.